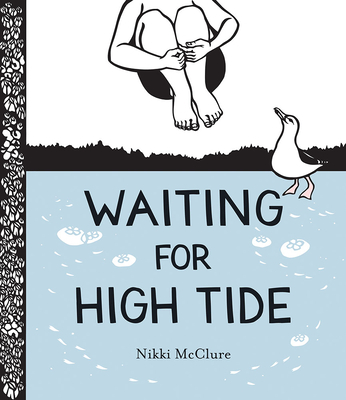 Nikki McClure is a self-taught cut-paper artist and the author-illustrator of many books for children, including In; To Market, To Market; Waiting for High Tide; and Mama, Is It Summer Yet? She lives in Olympia, Washington. "Astounding full-bleed, cut-paper illustrations (in black and white with isolated use of pink and blue) appear opposite the narrative—muted, matte, and miraculous. Clumped kelp, rippling water, clambering crabs, banks of barnacles, round cheeks, the curvature, of feathers and barbed beaks, bark on logs—all achieve extraordinary, evocative clarity through lacy cutouts within the context of gratifying, gorgeous compositions. The tide has brought an extraordinary book to our shores." "… McClure’s cut-paper images are at once sweeping in their scale and extraordinary in their detail... A splendid seaside tour worth poring over. For general picture book collections as well as curriculum units on natural science." "McClure’s distinctive artwork—black paper cut with an X-ACTO knife and fountain pen—has never been richer. The simple palette of black, white, and blue, accented with the occasional pink (the sunglasses, the heron’s long legs, the gulls’ feet), is stunning. Children will love searching for the marine animals and detritus. Delicately penned endpapers illustrate the steps in raft-building, and some shore creatures. A celebration of the natural beauty of a summer’s day on the Olympic Coast." "Stunning paper-cut and fountain ink illustrations bring readers to the Salish Sea for a day of raft building and waiting for high tide."